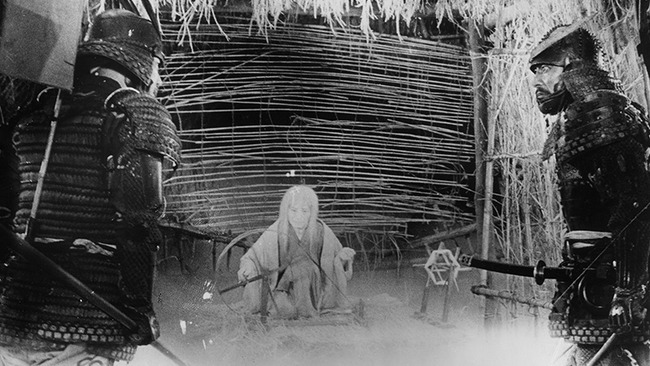 Critics commonly describe Throne of Blood (1957) as Akira Kurosawa’s adaptation of Macbeth. While this description is certainly not untrue, the film is much more than a direct cinematic translation of a literary text. Kurosawa’s movie is a brilliant synthesis of diverse cultural, aesthetic, and historical sources, only one skein of which derives from Shakespeare. The film’s towering achievement lies in the way Kurosawa seamlessly integrates these and gives them superlative formal expression. Kurosawa often turned to foreign literary works for his films, but in all cases, the result was a transposition of the source rather than anything as straightforward as an adaptation. His appropriations of Shakespeare (here as well as in 1985’s Ran), for example, were acts more of historiography than of analysis, and descriptions of the films as adaptations minimize the true nature of what Kurosawa accomplished. In Throne of Blood, with his keenly developed sense of Japanese history, he found a kind of mirror universe in the period of turmoil, treachery, and succession battles that Shakespeare wrote about in Macbeth. Shakespeare’s play derives from a regicide and other historical events in eleventh-century Scotland. Emerging ideas of national unity and kingship were then vying with civil disorder caused by battles for power among regional lords. Struggles over succession often resulted in bloodshed. Malcolm II, grandfather of Duncan, the king Macbeth killed, seized the crown by slaying a rival prince and eliminated other rivals to ensure Duncan’s succession. Duncan, in turn, was killed when he unwisely ventured into Macbeth’s province in the north of Scotland. Kurosawa was keenly impressed with the heritage of violence that he saw in the play and its history. He once remarked that, in depicting an age when the strong preyed on the weak, Macbeth had a focus in common with all of his films. The parallel Kurosawa intuited and explored was with the century of civil war in medieval Japan. Following the Onin War, which lasted from 1467 to 1477 and laid waste to the imperial city of Kyoto, the nation entered this prolonged time of turmoil, the Sengoku Jidai (the Age of the Country at War), which was marked by internecine conflicts among rival clans, the absence of a central political power, and the kind of treachery, prevarication, and murder that Kurosawa dramatizes in Throne of Blood. Warlords violently seized domains, murdered trusted associates, and were killed in turn by their vassals. Washizu (Toshiro Mifune) may enact a story whose outlines are those of Macbeth, but he personifies elements of the historical spirit of his own age. Kurosawa’s chronicle is a highly selective one, however. As with his literary sources, his treatment of history is faithful to elements of the factual record while transposing them into poetic terms.He made the sixteenth century his own period by being one of the few Japanese filmmakers of his time to explore it. In Seven Samurai (1954), Throne of Blood, The Hidden Fortress (1958), and Ran, Kurosawa concentrates on the epoch’s military strife, and his presentations of those conflicts are so apocalyptic as to imply that widespread killing was taking place in Japan’s medieval era. In fact, the rate of battlefield death in the samurai wars was not so extensive. Kurosawa gives us battles filtered through his perceptions as a twentieth-century artist well acquainted with the truly large-scale slaughters of his own time. The sense of apocalypse in the films is not of the sixteenth century but contemporary. Kurosawa’s transposition of Macbeth points to the transcultural materials in the play—the common human experience that underlies it—but also vitiates the Shakespearean elements. All that beautiful dialogue is gone. That surely makes it an odd adaptation, except that Kurosawa has transposed not only history but theater as well. There is plenty of theater in this film, but not the sort the King’s Men would have staged. Kurosawa’s radical gesture here is to supplant Shakespeare with Noh theater. Emerging in the fourteenth century and patronized by samurai lords, Noh was contemporaneous with the age Kurosawa depicts, and therefore he felt that its aesthetic style would furnish the right kind of formal design for the film. (In Ran, when he again transposed Shakespeare to sixteenth-century Japan, he again incorporated Noh elements.) Besides, he loved Noh and found it inexpressibly beautiful in its own right. Noh shows up everywhere in Throne of Blood, making the project a real fusion of cinema and theater and showing just how cinematic theater can be in the hands of a great filmmaker. Noh elements include the music (that assertive flute, for example), the bare sets, and especially the stylized performances by Mifune and Isuzu Yamada (as Asaji). Noh performing style, with its blend of dance, song, poetry, and mime, is antithetical to the realism and naturalism that invests acting in the West. It counters the meaning of Shakespeare’s famous lines in act 3, scene 2 of Hamlet about the actor holding the mirror up to nature. Performance in Noh aims for a paradoxical conjunction of elements. When an actor moves in a powerful way, he must stamp his foot gently. Noh performance is a striking blend of stillness and agitation, a mixture of different gestures and tones that can be seen in the acting throughout the film, and that Kurosawa even carried over into the cinematic design of entire sequences, as when he cuts from a long, static scene of ritual immobility and austere playing to a scene of furious action choreographed with flamboyant camera moves. Actors in Noh use masks, and while Kurosawa doesn’t do anything so blatantly artificial here, he does have Mifune and Yamada model facial expressions that resemble popular Noh masks (a strategy he extended in Yamada’s makeup). The Noh masks point to a huge difference between this theatrical tradition and Shakespeare’s, one that helps give the film many of its unusual qualities. Noh is not psychologically oriented; its characters are not individualized, they are types—the old man, the woman, the warrior, and so on. And the plays are quite didactic, aiming to impart a lesson. Kurosawa, therefore, strips all the psychology out of Macbeth and gives us a film whose characters are Noh types and where emotions—the province of character in the drama of the West—are formally embodied in landscape and weather. The bleached skies, the fog, the barren plains, and characters going adrift against and within these spaces—this is where the emotion of the film resides. It is objectified within and through the world of things. As a result, the film has a definite coldness; it keeps the viewer outside the world it depicts. Kurosawa wants us to grasp the lesson, to see the folly of human behavior, rather than to identify or empathize with the characters. As a positive value, this pictorial and spiritual emptiness is set against the human world of vanity, ambition, and violence, which Kurosawa suggests is all illusion. The Buddhist arts of Noh and sumi-e enabled him to visualize this disjunction between the hell of life as we poor creatures know it, subject to our strivings, our desires, and our will, and the cosmic order that negates them. If Kurosawa strips the psychology from Macbeth, he also strips out Shakespeare’s political conservatism, refusing to give us the play’s reassuring conclusion (flattering to James I) in which a just political authority triumphs. In Kurosawa’s film and worldview, the cycle of human violence never ends. Thus the film’s many circular motifs describe the real tragedy at the heart of the history that Throne of Blood dramatizes. Why do people kill one another so often and through so many ages? Kurosawa had no answer to this question. But he showed us here, through the film’s chorus, its circularity, and its Buddhist aesthetics, that there may not be an answer within this world. The aesthetics and philosophy of Throne of Blood take us well beyond Shakespeare, and that’s why this is a great film. Its accomplishments are not beholden to another medium or artist. Kurosawa gives us his own vision, expressed with ruthless, chilling power, and it’s the totality of that vision, its sweep and its uncompromising nature, that moves and terrifies us—and that we are so seldom privileged to see in cinema.